There maybe alterations to this so it is best to check out are facebook page as all information on training will be posted their. 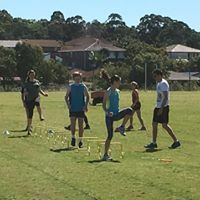 Each session will run for between 1 and 2 hours at Myimbarr Community Park, each session will cost $5.00, session will be tailored to those that attend with Sprints, Distance, Walks, Throws, Jump (excluding H/Jump) and Hurdles being covered. Training and coaching sessions are available to all registered athletes from the UNDER 7’s and Upwards. Training and Coaching session will focus on the fundamentals of Track and Field, there will be every endeavour to cover all events, each training sessions will be different and unique, there will be no specific training day for events. Non-co-operative or misbehaving athletes may be excluded from coaching sessions if necessary, if this occurs on numerous occasions then they will be barred from attending training sessions. Athletes are asked to bring adequate fluids as well as a tracksuit or suitable warm weather clothing to wear after each session has completed. In the event of inclement weather the coach may suspend a session at any time, should this occur the coach is under NO obligation and will not take responsibility for any athletes left unattended unless the above has been adhered to.